As you may already know, I am always interested in bicycle lights. No matter how many lights I already have on my bikes, I will still want to check out new lights to see if they are better than what I already have. 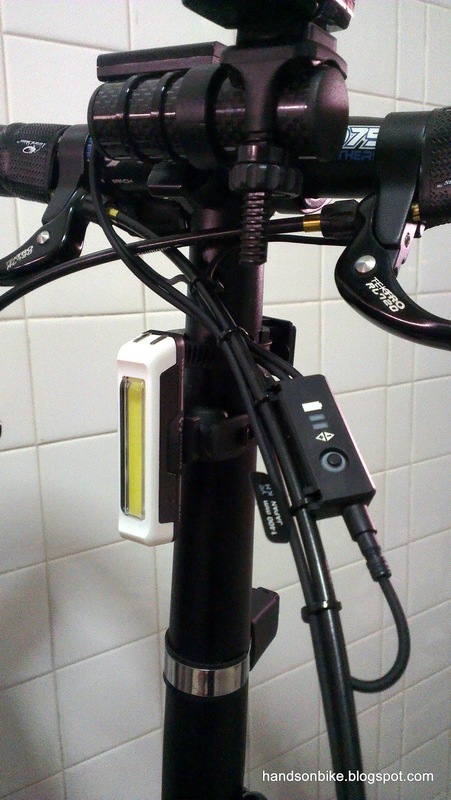 It seems that the recent trend for bicycle lights is to use USB recharging, so that there is no need to keep changing batteries when the light goes dim. 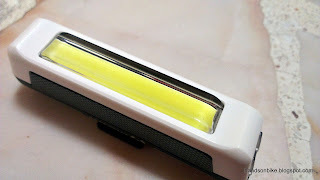 For myself, I try to use lights that can use standard rechargeable AA or AAA batteries, while minimizing the use of lights that use button cells. 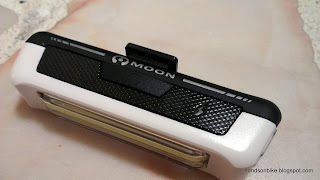 At the recent OCBC Cycle exhibition, I came across this new brand of lights called "Moon". 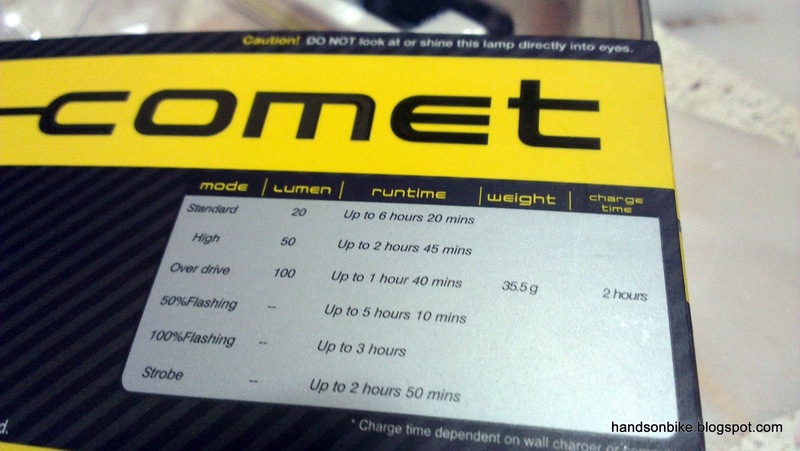 Although I have read about the brand in magazines, I did not know much about the lights until then. What surprised me was how bright it was, given its small size! 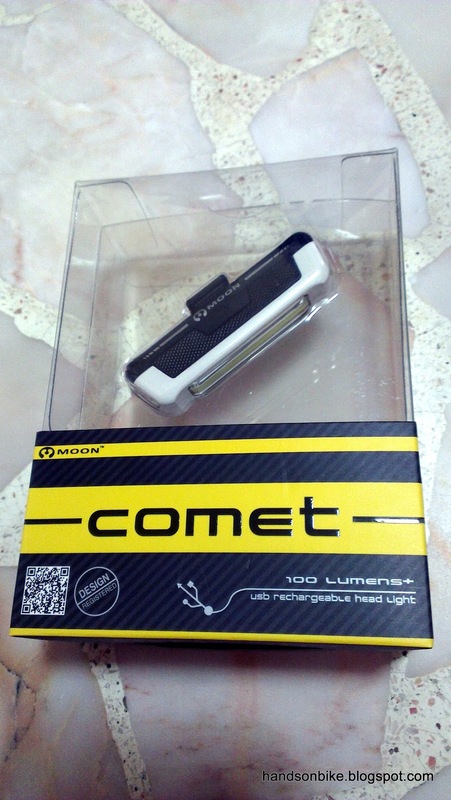 Let's take a look at the Moon Comet Front Light which I bought. Diagram showing the spread of light at different distances. 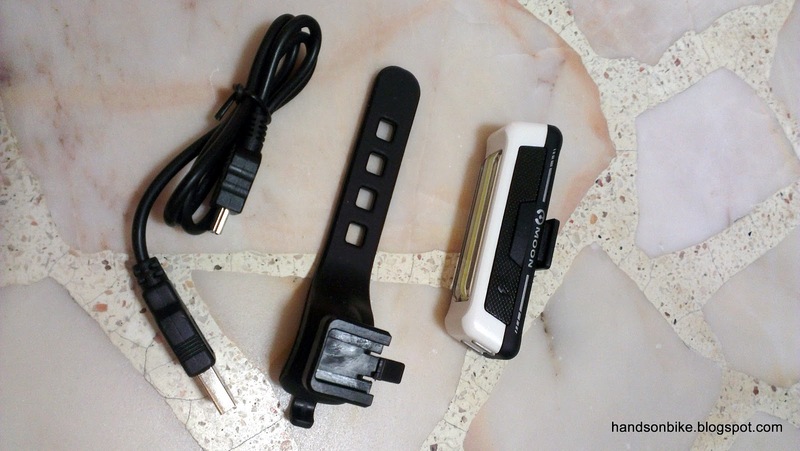 The accessories that came with the light. 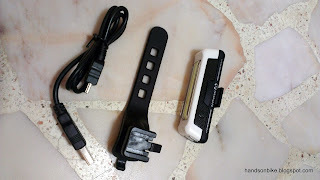 A standard mini USB cable for charging, plus a rubber strap mounting. The power button located on the side of the light. Pressing on the button for 1.5 seconds turns the light on or off. New type of LED packaging technology, called COB (chips on board) LED. This is the special LED that caught my eye, and this is what differentiates it from the other thousand and one lights out there. 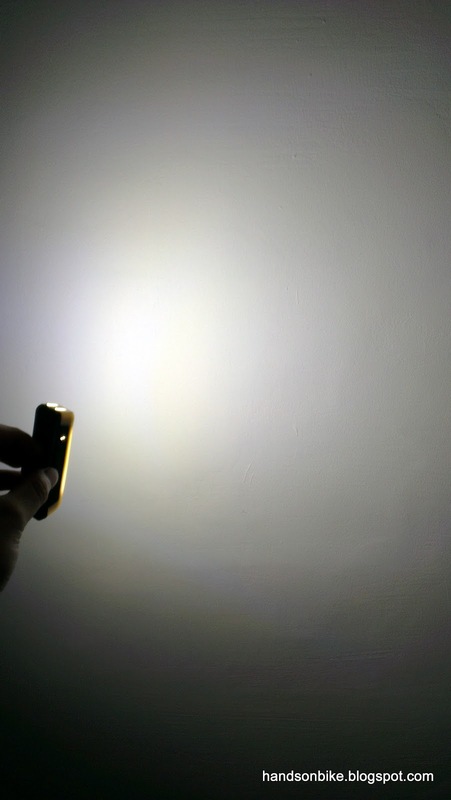 The traditional LED is a single chip that sits within a small bulb, and it can be found on almost every other LED light out there. However, the new COB LED technology used in this Moon Comet front light embeds these LED chips within a panel, creating a flat light source and high chip density. What this means is more LED chips within the same amount of space, enabling higher brightness and more uniform lighting. On this light, there are 32 LED chips embedded in the panel. 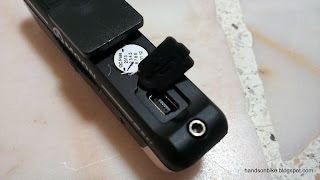 Rubber cover for the USB charging port. USB port covered to protect against dust and rain. 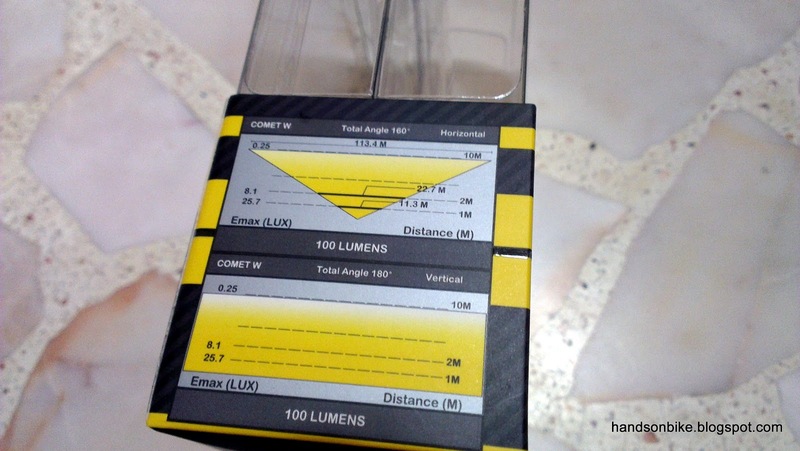 This light has 6 lighting modes, which can be separated into 2 different types, constant and flashing. For constant mode, you can choose between 20%, 50% and 100%. 20% is quite OK for city use where the path is well lighted. 100% is really bright and is surprisingly blinding. Good enough for on the road usage. 50% is for anything else in between. As for the blinking mode, there are also 3 types. Flashing at 50% brightness, flashing at 100% brightness, and a strobe type of flash. 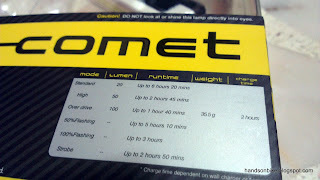 For myself, I use 50% flashing when I cycle on the road, as it gives me a good balance between brightness and runtime (up to 5 hours). I find that the strobe mode which flashes something like 5 times per second is too seizure-inducing to use. It is probably useful if you wish to irritate somebody with this light. 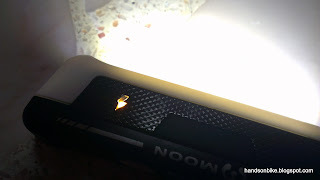 Orange LED showing the battery level of the light. When it blinks, it is time to charge the battery. Mounted vertically on my handlepost. 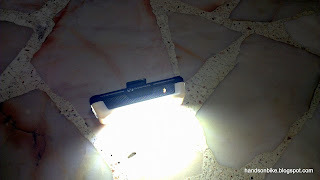 It can also be mounted horizontally by rotating the light 90 degrees. 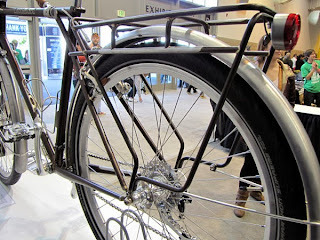 This light suits a folding bike well as it can be nicely mounted on the handlepost, freeing up space on the handlebar. 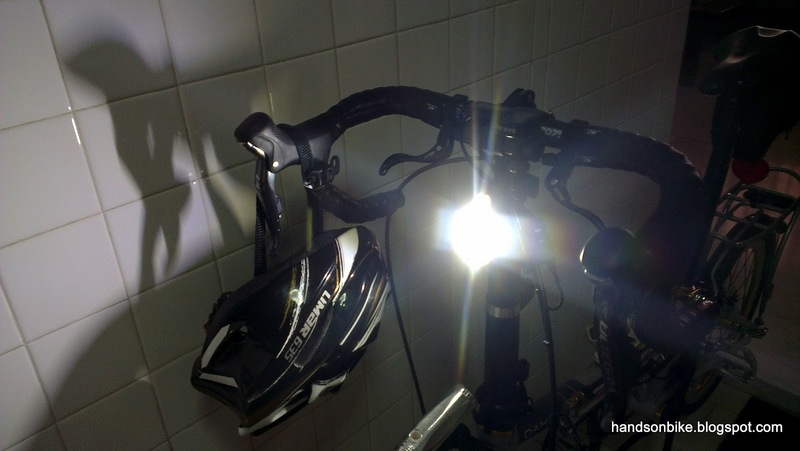 Gives off a uniform glow that has a wide viewing angle, without the use of any reflectors. 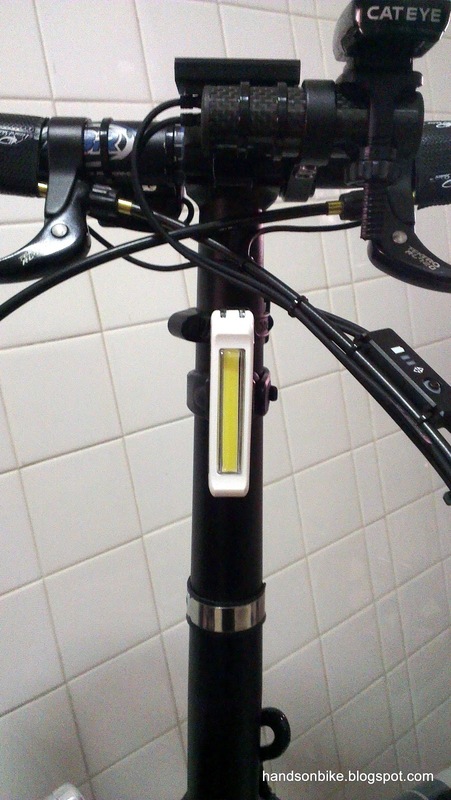 Note that even my shifters which are way off to the side of the light has a shadow cast on the wall. 2) Wide viewing angle. Great as a to-be-seen light. 3) USB charging. No need to bother about batteries. 4) Versatile rubber mount. Can be mounted almost anywhere on the bike. Easy to remove when not required. 5) Sturdy casing, feels well built and not flimsy. 6) COB LED packaging gives off a nice glow that looks like a solid bar of light. 7) Many different lighting modes to suit different riders/situations. 1) Runtime is a bit too short. Charging is probably required after every 2~3 night rides, depending on the length of the ride. A bit troublesome to keep removing the light and reinstalling on the clamp. 2) Rubber seal for USB port feels a little loose. May not be able to keep out the rain effectively. 3) Difficult to switch between modes easily. To elaborate on the switching of modes, the modes are separated into two different groups, constant and blinking. When you are in the constant mode, pressing the power button for 0.5 seconds will cycle through the 3 constant lighting modes. Same for when you are in the blinking mode. However, the tricky part is switching between constant and blinking modes. It seems that you need to press for 1.5 seconds to switch between modes. Sounds easy according to the manual, but for me, it operates rather inconsistently. Sometimes it works, sometimes it just turns the light off. Even now I find it difficult to switch quickly between modes, most of the time it is trial and error. This light cannot be used as a to-see light, as the light beam is too diffused to light up the road effectively. However, because of the diffused lighting, it is great as a to-be-seen light as you can be spotted easily due to the wide viewing angle. Overall, I am quite pleased with this light as it replaces my previous to-be-seen light by Cateye. Not only is this light brighter, it also looks much sleeker on the handlepost. 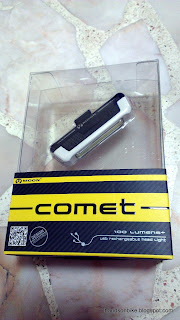 For those who are interested in this light, it also has a rear version with red COB LED. Hi do you know where can i buy this in Singapore? 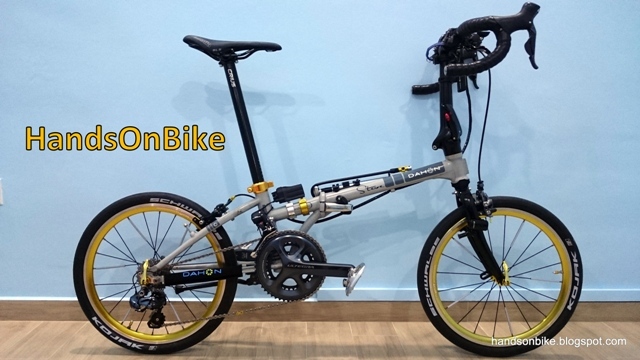 I think they are available in many places, such as MyBikeShop, C2C, etc. have you got your hands on Knog Blinder Road? would like to read a review by you. I don't have those lights, but I considered them when looking for a new front light. However they don't have a front version that is built like the rear one. Pardon my ignorance but can I charge this light by plugging into my iPhone wall charger? Yes, you just need to use a cable with a mini usb plug. Hi I just got the light and I was charging it and realise there is no indicator when charging...is the indicator only when it is fully charged/low battery? When charging, the small orange light at the side will pulse to indicate that it is charging. how do i know that its full? 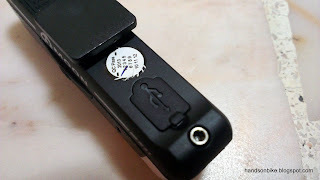 If I'm not wrong, the indicator light will be lit continuously and no longer blink/pulse. I've got the red version of this light and really like. I initially also had trouble switching between blinking and non-blinking modes, but once I figured out the trick it became easy. Don't try to hold the button for 1.5 seconds to switch modes, just hold it down until it switches. When you press and hold the button, after a brief period the light will start to fade out. If you release the button while the light is fading it will continue to fade and then shut off. If you continue to hold the button, it will fade completely out and then immediately come back on in the other mode.